More than 60 years ago, Hoyt and Ruby Alexander had a dream to leave behind a legacy for generations to come. In 1953, Hoyt and Ruby purchased a small trading post in the Trackrock area of Blairsville, Georgia. Hoyt began selling feed and seed, a few groceries, and gas to those in the community and anyone else who might be passing through. If a customer came into the store looking for something Hoyt didn’t have, he was more than glad to make a special trip wherever he needed to go to get whatever the customer wanted. Not too long after, Hoyt and Ruby noticed a need in the community for clothing and shoe sales. So, they set aside a very small section of the store and began carrying a few clothing necessities. Hoyt and Ruby’s youngest son, Eddy, came home to Blairsville after seeking employment elsewhere. Nothing had felt right to him, so he settled down to help his folks with the store. Eddy was a 24-year-old man with dreams, and boy, were they big dreams. He decided to add hardware supplies and appliances to the store’s inventory. And he also had a desire to carry guns and ammunition. As Eddy’s plans took off, Hoyt soon realized that his own dream of leaving behind a legacy was going to come true. In 1978 Eddy met Sandy while working in the store. The couple soon married, and it was only fitting that Sandy come to work in the family business. If Hoyt and Ruby thought Eddy had big dreams, Sandy had even bigger ones! While Eddy was busy getting the hardware, appliances, and sporting good departments established, Sandy was in the process of growing the clothing and shoe departments. Needless to say, with two young whippersnappers who thought the sky was the limit working there, the store began to expand. A room here and a room there, knock this wall out, add a wall here, and the store quickly went from a tiny trading post to a large department store in the middle of nowhere. In the mid ’90s, Eddy and Sandy decided that furniture would be something good to add to the mix of things. Hence the store would need to be enlarged again. By now, Alexander’s sold gas, groceries, appliances, men’s and ladies’ clothing and shoes, guns and ammunition, and furniture. All of this while functioning as True Value hardware store! Sadly, Ruby passed away in 1995, and Hoyt passed away in 2001. But they both lived to witness their dreams become reality. Today, we at Alexander’s make sure their values and traditions live on: treat everyone with respect and service with a smile. Today the store has an incredible 50,000 square feet of retail space which is hard to imagine just standing out front. Since Alexander’s is so unique, many people regard the landmark as a tourist attraction. 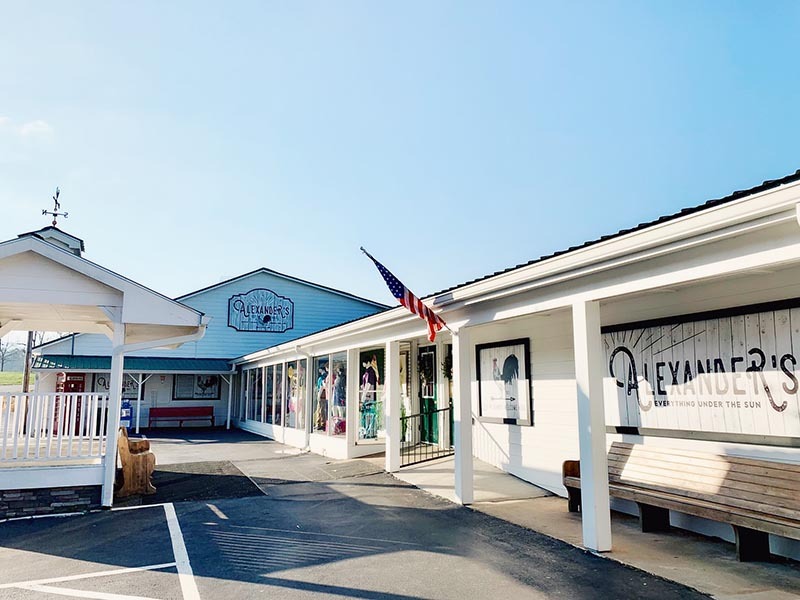 What began in 1953 as a small general store has now evolved into a shopping experience with casual yet trendy clothing and shoes, furniture, appliances, guns, and ammunition. 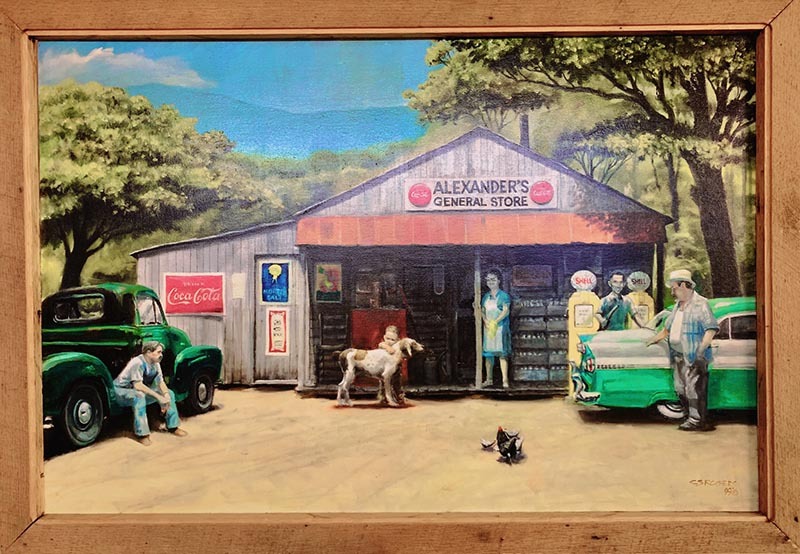 As a family-owned business, Alexander’s maintains a set of shared traditions and values deeply rooted in the history of the store. Hoyt and Ruby instilled these traditions in Eddy and Sandy, who are passing them on to their son, Mark, and his wife, Kennetha, the third generation to operate the store. So, you see — Alexander’s is more than just a store. It’s a testimony of how a family business can be handed down from one generation to the next and be successful in today’s era of mega stores and online shopping. The next time you travel to the north Georgia mountains, stop in and wander around the store. We’d love to meet you!